While guitarists spend much time improving their improvising skills, for the majority of time, they must also fill the role of supporting other instrumentalists or vocalists on the bandstand. 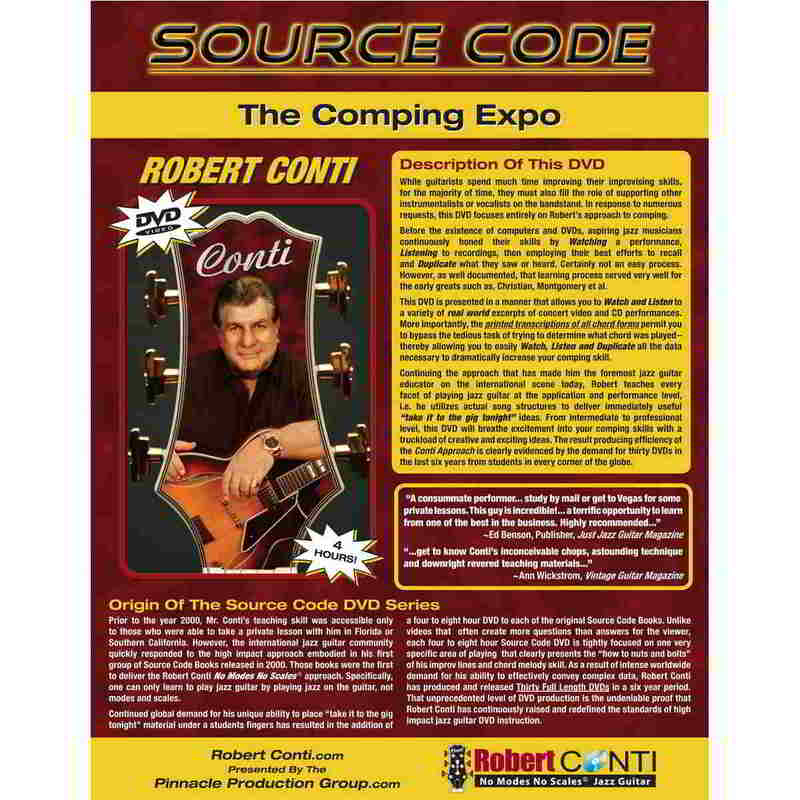 In response to numerous requests, the Comping Expo focuses entirely on Robert’s approach to comping with real life excerpts from his CDs and live performance. While guitarists spend much time improving their improvising skills, for the majority of time, they must also fill the role of supporting other instrumentalists or vocalists on the bandstand. In response to numerous requests, The Comping Expo focuses entirely on Robert’s approach to comping. Before the existence of computers and DVDs, aspiring jazz musicians continuously honed their skills by Watching a performance, Listening to recordings, then employing their best efforts to recall and Duplicate what they saw or heard. Certainly not an easy process. However, as well documented, that learning process served very well for the early greats such as, Christian, Montgomery et al. This DVD is presented in a manner that allows you to Watch and Listen to a variety of real world excerpts of concert video and CD performances. 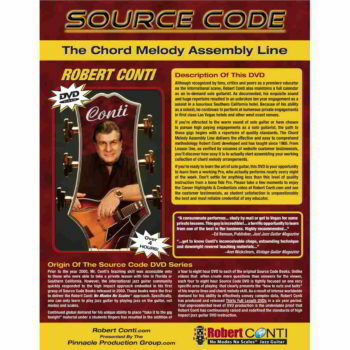 More importantly, the printed transcriptions of all chord forms permit you to bypass the tedious task of trying to determine what chord was played–thereby allowing you to easily Watch, Listen and Duplicate all the data necessary to dramatically increase your comping skill.Continuing the approach that has made him the foremost jazz guitar educator on the international scene today, Robert teaches every facet of playing jazz guitar at the application and performance level, i.e. he utilizes actual song structures to deliver immediately useful “take it to the gig tonight” ideas. From intermediate to professional level, this DVD will breathe excitement into your comping skills with a truckload of creative and exciting ideas. The result producing efficiency of the Conti Approach is clearly evidenced by the demand for thirty DVDs in the last six years from students in every corner of the globe. 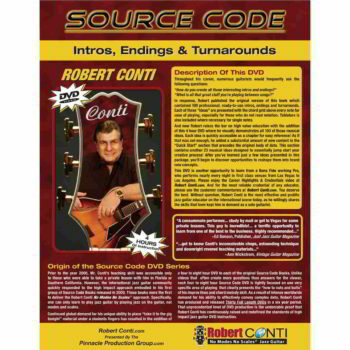 4 Hour DVD showcasing Robert’s approach to comping over Bossa Nova, Blues, Bebop, Swing and Ballad styles. Robert teaches at the “song level” with real life excerpts from his CDs and live performance. He teaches what he plays and plays what he teaches. Before The Gig” chapter provides a variety of ideas, concepts and a readily usable vocabulary utilizing The Girl From Ipanema and Autumn Leaves as project tunes. 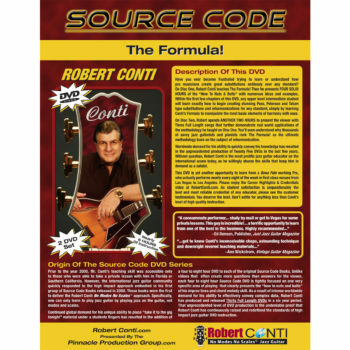 At $39.95, you now have access to Robert Conti’s knowledge at the rate of $9.99 per hour of professional instruction – an unbeatable price worth many many times the cost of admission! Lucky owner of your newest Source Code DVD, “The Comping Expo”, and may I say, that I am thrilled once again, and in awe not only with your talent, but the ability for it to come through on my end, to help further develop my skill! All your DVDs and Books are fantastic, and I would recommend them to anyone that is interested in playing jazz guitar. Thanks for everything! I used to comp chords in mainly one position or form. I have a great knowledge of chords and how they are formed, but no one or no book ever showed me how to make interesting movements within the measures of the song. The Comping Expo has opened up new doors for me! Man, o man – this is the greatest – I love it! Can’t say it enough, but I’ll try…I’m the Autumn Leaves-inest, Ipanema-nest, chordally hip guy in this neighborhood – and man, that Equity guitar is SUCH a joy to play – yeah, I’ve got investment property foreclosures, and being broke at mid life is not what I was planning, but, in the words of Bobby Darin, ala Kevin Spacey, “As long as I’m (sic) swingin’….” and this stuff swings for me…Thanks!!!! This is the best teaching material that I have ever purchased by far. Keep up the good work. Looking forward to studying with you someday. I’m doing great with the DVD! This is the best teaching material that I have ever purchased by far. Keep up the good work. Looking forward to studying with you in person someday.